12/20/2018 – All yacon preorders are sold out. We will probably have a little more in stock after completing harvest in a couple of weeks. Yacon (Smallanthus sonchifolius) is a South American member of the sunflower family that produces large, edible storage roots. The roots are sweet but low in calories due to high fructooligosaccharide (FOS) content. Varieties are clones and are maintained by planting pieces of rhizome. 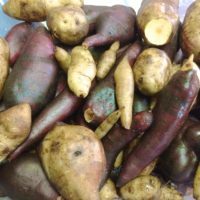 It is also possible to grow yacon from seed in order to breed new varieties.